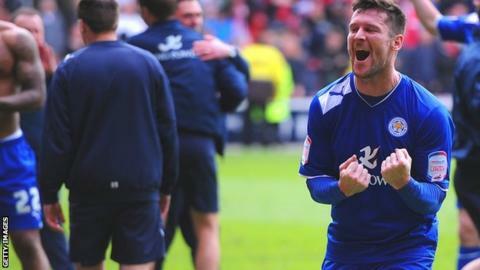 Leicester City striker David Nugent wants to sign a new contract when his deal expires at the end of the season. Nugent, who joined the Foxes in the summer of 2011, is one of 11 players who are out of contract in the summer. The 28-year-old told BBC Radio Leicester: "We have not talked yet but I am sure it will be coming soon. I have loved my time here, it's my third year and I want to stay longer." Boss Nigel Pearson and captain Wes Morgan will also be out of contract. Kasper Schmeichel, Sean St Ledger, Marcin Wasilewski, Wes Morgan, Paul Konchesky, Zac Whitbread, Neil Danns, Martyn Waghorn, Gary Taylor-Fletcher, Lloyd Dyer and David Nugent could all be leaving the club in the summer. Pearson has said his situation is not a concern and does not want any uncertainty over new contracts to affect the club's push for promotion from the Championship. "It can't become an issue because otherwise it becomes a distraction," Pearson said. "Let's focus on the job in hand and that's winning games. "I just feel it's an issue that's being ramped up a little bit too much. I don't see any reason we can't get on with the job without having reassurance all the time. "We have got to get on with the job. I'll get on with mine and I expect the players to do the same." Former England international Nugent, who has scored 42 goals in 119 games for City, added: "In January the lads are allowed to talk to other clubs. "But the 11 of us who are out of contract are a close-knit bunch and I wouldn't be surprised if every one of us wants to stay."